Recently, I came across the article "Social Media- Finally Ready for Electronics Manufacturing?" The post was written by Beth Dickinson, a Marketing Consultant for the company TFI, which provides strategic advice and market insights to clients worldwide. The blog post posed the question: What does social media have to offer component distributors, solder-paste makers, and contract manufacturers? Throughout the article, multiple electronic manufacturing companies are highlighted for their use of blogging, tweeting, or connecting digitally with their customers. Ultimately, that is what digital marketing is all about. It is not a replacement for traditional marketing techniques like direct mailers or trade shows. Digital marketing is a way to establish your electronic manufacturing company's online presence, which will ultimately allow you to better connect with customers, partners, and suppliers. At RBB, establishing our digital marketing plan began with an overhaul to our website. In order to better connect with those on the web, we wanted to make our website as informative and as user friendly as possible. In addition to creating a brand new website, RBB teamed up with an inbound marketing company called SyncShow Interactive to better implement our company’s goals and vision. SyncShow's services range from search engine optimization, and email marketing, to social media strategies. With their help we have been better able to connect and reach our customers digitally through email newsletters, customer surveys, website analytics, ad campaigns, blogging and social media sites such as Facebook, YouTube and LinkedIn. However, not all electronic manufacturing companies need outside support to create and implement a digital marketing strategy. This summer, I had the opportunity to attend a seminar put on by Wire-Net, an organization in Northeast Ohio that helps manufacturers fuel economic growth. The theme of the seminar was "Do I Need Social Media- I'm A Manufacturer" and was taught by Kristy Amy, Director of Digital Strategy for Smart Business Network. This valuable training stressed the benefits of email marketing, utilization of social media, and the importance of creating a digital marketing plan. Whether you use outside help, or you personally attend webinars, read blog articles, or other marketing related materials focused on digital marketing, educating yourself on all the options out there is the first step. Social media is definitely a large part of digital marketing, but before taking advantage of every social media outlet out there, creating a digital marketing strategy is essential. When creating a digital marketing plan, it is important to outline your goals. What is it you want for your electronic manufacturing company? More business and lead generation? More customer contact and feedback? More marketing of what your company provides? The ability to connect and share knowledge with others in your industry? All of the above? By outlining your goals, you're able to better customize your strategy for the digital marketing platforms you may want to implement. An electronic manufacturing company may not need an Instagram or Pinterest account. (If you have no idea what either of those are, go back to the first step I mentioned and research!) Knowing why you are using these marketing platforms is essential. If one of your goals is a way to better connect 24/7 with your customers, then Twitter may be a great option. If your goal is to communicate and get customer and audience feedback, YouTube or Facebook could be great tools. If your goals are focused on educating and sharing knowledge with other electronic manufacturers then blogging or LinkedIn could be good social media outlets for your company. So What Does Digital Marketing Have to Offer Your Electronic Manufacturing Company? 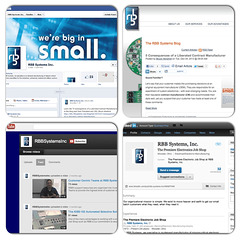 In the meantime, you can read more RBB blog posts, like us on Facebook, connect with us on LinkedIn or check out our YouTube videos to help build your network.